Live by the… Good guy with a… It’s all silence until the shoe’s on the other foot. You know what I call that? Karma. I was listening to WAMU on the way in to work yesterday. I tuned in late because I got on the road late, so I didn’t hear the top news until just before BBC News Hour came on, and that’s when I heard about the shooting in Alexandria. The BBC reported about shots fired during the practice session leading to today’s traditional Congressional Baseball Game. As soon as I got where I was going, I checked in. As it happens, that ball field is right around the corner from friends in VA, and they had a different perspective on what was going on. Lots of fire engines, no idea why until checking in on Social Media. Me, I waited to hear the name of the shooter. By 9am, when the report came through, they’d released that it was a white guy, but had no other details. Since then, details have emerged. Top on the list, that he was originally from Illinois, was 66, and had supported Bernie Sanders, making it quite clear on his Facebook page that he hated Trump and felt no better about Hillary Clinton. Additional details have also come to light. He was living in his car, had been in Virginia since March. Left his home inspection business when his license wasn’t renewed. And he was arrested for domestic abuse. 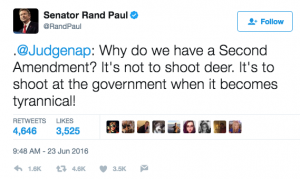 The pure unadulterated irony in Rand Paul’s tweet from 2016 has not remotely escaped me. Hasn’t escaped the notice of a lot of other people, either. And the funny thing is that tyranny is in the eye of the beholder. Obviously, or yesterday’s events wouldn’t have happened. “I have just been informed that the alleged shooter at the Republican baseball practice is someone who apparently volunteered on my presidential campaign. I am sickened by this despicable act. Let me be as clear as I can be. Violence of any kind is unacceptable in our society and I condemn this action in the strongest possible terms. Real change can only come about through nonviolent action, and anything else runs against our most deeply held American values. The NRA is working toward allowing Concealed Carry in all the states, regardless of state law. Yesterday they were set to debate easier availability of silencers. They suspended that discussion in light of the events yesterday in Alexandria. Go back and reread what they said about Gabby Giffords. Meanwhile, there’s a whole bunch of silence about the OTHER mass shooting that happened yesterday in California. Funny thing: These two events are related. So are a lot of other incidents like these. Charles Slater was arrested March 15 at the Denver airport, along with Kong “Jimmy” Lam, 26, of Oakland. They are charged with a home-invasion robbery in Littleton, Colo.
Yeah, that’s the same guy. Prior record of violence. What a surprise. And yet…not a surprise at all. Domestic violence, the leading cause of gun injury and death in this country, is underreported, denied and encouraged by every individual who ever supported the repeal of bans on access to weapons. The NRA and Senator Steve Scalise are leaders in this movement to put guns in the hands of these abusers and keep them there. After all, when 20 kids get shot in cold blood and Congress does NOTHING even after it’s clear that this is what a large percentage of the country wants, why should we then be shocked when the violence comes here? Some people even have the gall to pretend that Sandy Hook never happened. No, I won’t give those assholes a platform here. You can go find the reprehensible truth for yourself. There are no extremes too large to justify what happened yesterday morning, but there’s a whole bunch of people up on Capitol Hill shaking their collective heads and looking for blame everywhere except right there, where it belongs. They own this. They are complicit. And they will do nothing. These gutless wonders who do the NRA’s bidding better figure out something soon, though. Otherwise, when history looks back at the start of the Second Civil War and they put it together that these people were the root cause, they will wonder why the American People didn’t do more to stop them. And there won’t be answers, just guns.